Product code: ES7935 Categories: Sold Items, Sold Watches. 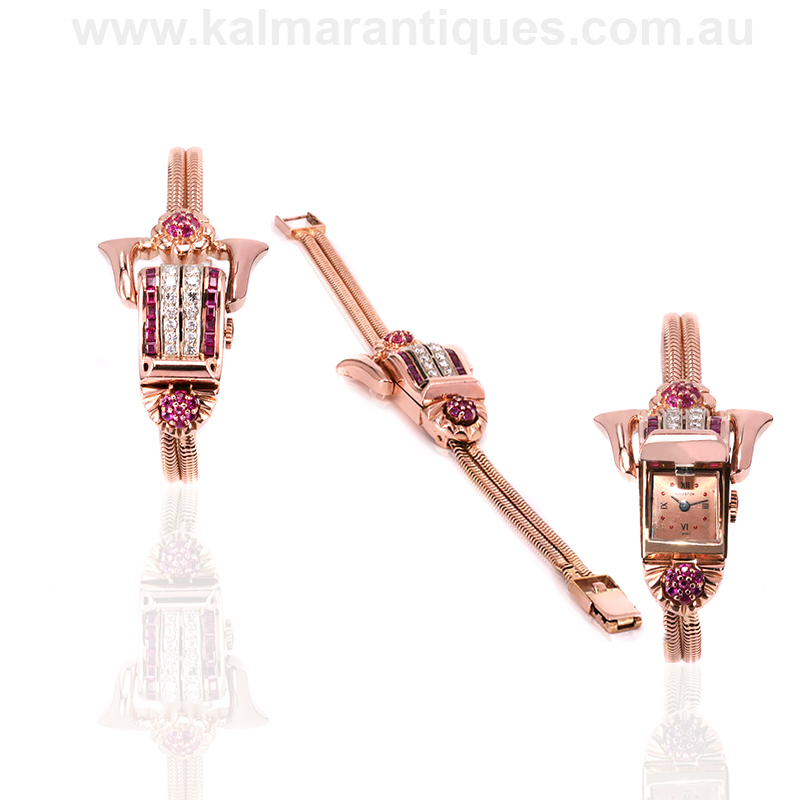 The Retro period of the 1940’s and the 1950’s resulted in some bold designs in jewellery including watches as well as innovative designs such as can be seen here in this amazing hinged top 14ct Retro watch set with rubies and diamonds. Made in rose gold which was often the case during this period, the colour of both the case and band is just amazing and accentuates the beautiful colour of the rubies and of course the incredible design of the watch case. Looking past the hinged top for the moment, the case itself has such an incredible sculptured design that really is like no other and shows why antique and vintage jewellery is so popular thanks to their unique designs. 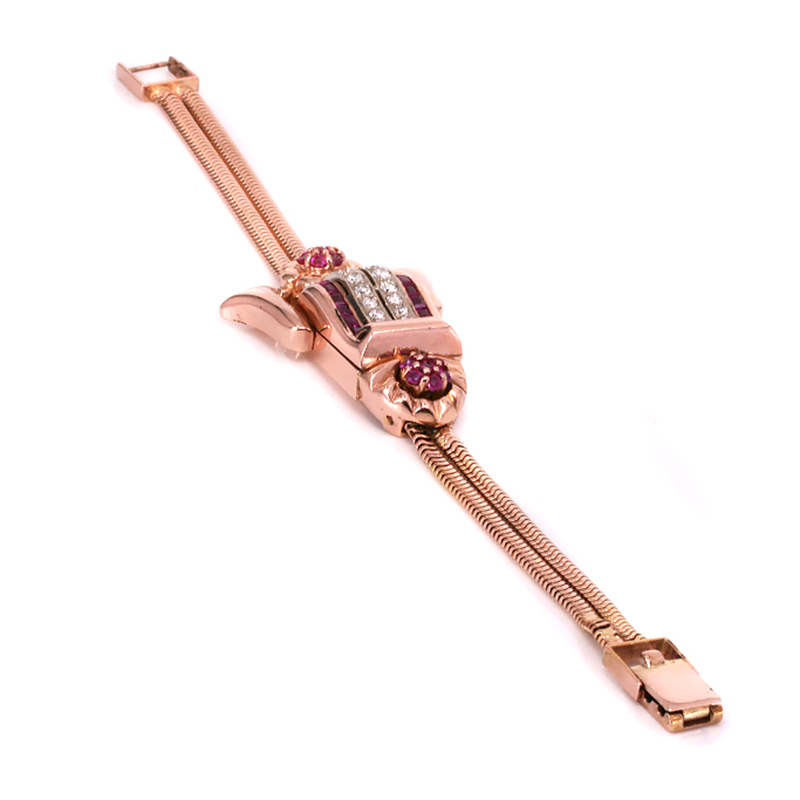 With a wonderful flared design that leads to a double row bracelet that itself wraps so beautifully around the wrist, from end to end the watch measures 17.5cm in length. Then of course there are the rubies and diamonds set into the hinged top as well as the two clusters of rubies at each end. On the hinge section there are two rows of seven diamonds that has a total weight of 0.52 carats and sparkle magnificently. And then there are two more rows this time set with seven square cut rubies that total 0.42 carats and the two ruby clusters each with seven rubies that adds a further 0.70 carats of rubies to the weight. Day or night, with this many rubies and diamonds, there is no doubt that it will always be admired and commented on. Upon lifting the hinge open, this will reveal the lovely salmon-pink coloured dial that has Roman numerals for 12, 3, 6 and 9 and red stone indicators for the other numbers and is signed “Kingston”. Kingston watches were a Swiss made movement coming from the watch making firm Record Watch Company. Due to patent restriction in North America, the company was not able to sell watches under their name of Record Watch Company, hence the name Kingston. And inside is a 17 jewel manual wind movement of theirs which has been recently completely serviced runs perfect and comes with our twelve month warranty. Day or evening, formal or informal, this is one truly special watch that will always be loved and admired. Tag: Retro ruby and diamond watch. A brief history on the Kingston Watch Company. Kingston watches are a Swiss made movement coming from the watch making firm, Record Watch Company. Due to patent restriction in North America, the company was not able to sell watches under their name of Record Watch Company. To be able to sell their watches in America company sold watches under several different names such as Rivera, Banner and of course Kingston.